The story runs out like other schoolgirl animes. It’s episodic. But what makes this anime special is that every episode is skillfully crafted with great care to soothe the viewer and give the viewer a happy grin every episode. Almost every episode is realistic so there are many episodes where the viewer can relate to the show. Ever tried to hide a bad test score from your mom? or run away from your mom only to come back later? If you have then you will feel right at home with Non Non Biyori. Every episode is a beautiful adventure in itself. From playing ball on recess to making a cultural festival for less than five people. Every episode is fun, soothing, and a joy to watch. 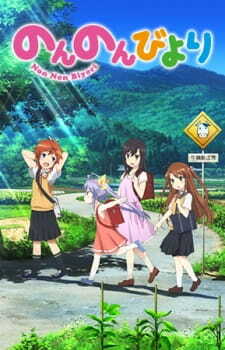 One look at Non Non Biyori and you know that silver link has put a lot of money into this anime. Movements are fluid. Designs are great, but what makes the art truly stand out is the background. The countryside is animated beautifully. The backgrounds feel alive. Everything from the trees to leaves falling. Even a river flowing is made with such detail. It’s like the cross between art and realism. It’s absolutely breathtaking. A great opening that fits this anime perfectly. The soundtrack is also something to listen to. Every track fits every scene accurately. The piano tracks are truly something captivating, and certain instruments like the harmonica are used to give the viewer that countryside feel. The ending song doesn’t have the same quality as the opening and the soundtrack but I warmed up to it after a few episodes. The story, animation, and the sound in Non Non Biyori are all beautiful, but what propels Non Non Biyori to be truly special is the characters. The main cast of Non Non Biyori consists of 4 characters. Komari Koshigaya, Natsume Koshigaya, Hotaru Ichijou and Renge Miyauchi. Komari is an eighth grader who is very self-conscious about her small and short body. Because of this, she tries to act grown up, usually without success. Then you have Komari’s younger sister Natsume Koshigaya. A seventh grader who hates studying and likes to play. She’s untidy, lazy, and her grades are terrible. She usually sees Komari as a younger sister than an older one because of her small body. Then you have Renge Chan. A talented and eccentric first grader. Although she usually acts like a typical first grader. There are some parts that show off her talents and her eccentric parts. Words really can’t describe her accurately. You just have to watch the anime for yourself. And last but not least you have Hotaru Ichijou. A fifth-grade transfer student from Tokyo who is physically mature for her age. She is polite and overall a nice person. But the twist is that she has a crush on Komari. Which is a basis for some of the comedy in Non Non Biyori. One very interesting thing about Non Non Biyori is how it develops its characters. Now at face value, these characters may seem somewhat stereotypical. But one thing that I really have to give Non Non Biyori credit for is its focus on fleshing out the characters. In every episode. You get to know more about the characters and they feel more and more alive and real as you get to know more about them and their interests, hobbies, and points of views. Their character designs may be cute, but Non Non Biyori doesn’t rely on that to make characters endearing. It relies on fleshing out the character and making them have depth. I felt like I was with them right there. It is something that many anime fail to do, and it is truly stunning. Non Non Biyori is definitely a beautifully crafted piece of art that should be viewed by not just fans of slice of life but fans of anime in general. So what are you waiting for? Hurry up and experience the soothing experience known as Non Non Biyori.